It’s time to plan out your training! As of this past weekend, we’ve got 12 weeks before our Get It Dunn race. That means it’s time to scope out training plans. If you are starting out, the 5k is a perfect distance for you. There are great Couch to 5k training programs and free apps for your phone that will have you ready to race by May 16th. Most programs are 8-9 weeks, so you’ve got a little time to scope out some options. Have a smart phone? Search for “free C25k” apps on your phone and pick one. Prefer printed plan? Search for “C25k” or “Couch to 5k training plan” in your favorite web search engine. 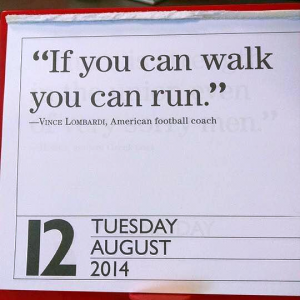 Then, get out a calendar and plan out when your training needs to start! For those of you that are looking for more of a challenge or that already have a pretty consistent running and/or workout routine, go for the Half Marathon! The course is gorgeous and with the right preparation, even if you’ve never ran more than 5 miles before, you CAN finish a half. It’s all about the preparation and training. Go scope out training plans and DO it!